Online accreditation training for psychometric tests, aptitude tests, personality tests and online training for the British Psychological Society BPS Level 1 & 2 RQTU Certification and the European Federation of Psychologists’ Associations (EFPA) Euro Test User Certificate. We are excited to be able to advance knowledge, understanding and competence in psychometrics globally from our bases in Asia, (namely Singapore and Hong Kong) with our high quality online psychometric test training courses. Our courses are designed and produced by Registered Psychologists – experts in psychometric testing at work. At the time of writing, our lead Psychologist has over 20 years of experience in facilitating the British Psychological Society’s syllabuses in Occupational Testing. Initially, this was the BPS Level A and B Certificates of Competence in Occupational Testing and now this is referred to as the BPS Level 1 & 2 RQTU Certifications. For those who successfully complete the relevant online psychometric test training courses above, they will become accredited to order and use the related tests from our website and from many other vendors. For example, those who complete the BPS Level 2 Ability Test User Certification will be able to order Aptitude and Ability Tests from us and other vendors. For those who go on to the BPS Level 2 Personality Test User Certification, they will be able to order and use the personality assessments at this website and those of a number of other vendors. Do note however that some vendors may request a short additional training course for personality assessments. The certification in psychometric testing offers your colleagues and/or clients confidence that you are competent, up-to-date and know your field when it comes to psychometric testing for workplace decisions. This is a great accolade to add to your CV, Linkedin profile and Corporate introductions among others. From time to time, our psychologists offer complimentary webinars on topics related to psychometric testing at work. We also offer Online Psychometrics Masterclasses – whilst Masterclasses have a nominal fee associated with them, the fee is discounted by at least 50% for all clients who have purchased any psychometric test from us in the 3 months prior to the webinar. Stay current and cutting-edge in psychometric assessment and have this count towards your BPS Maintenance of Competence Requirements. To be informed of upcoming events, please subscribe to our Newsletter and we shall always inform you in good time prior to our Webinars and Masterclasses. This is the first stage towards becoming more familiar with the ethical and competent use of psychometric tests. Successful completion of this online psychometric test training course results in the BPS Level 1 Assistant Test User Qualification and you will be able to administer and score psychometric tests, but you will not yet be accredited to interpret them or to give feedback to respondents and decision-makers. Building on the BPS Level 1 Certification, this course considers more advanced issues in psychometrics generally and also focuses on competent ability and aptitude test use. Successful completion of this online psychometric test training course results in the BPS Level 2 Ability Test User Qualification and you will have the skills to choose the right ability/aptitude test for your purpose, as well as to administer it, interpret scores and give feedback to both respondents and decision-makers. Building on the BPS Level 2 Ability Test User Qualification, this course covers competent use of personality, values and interest assessments at work. Successful completion of this online psychometric test training course results in the BPS Level 2 Personality Test User Qualification and you will have the skills to choose the right personality tool for your purpose, as well as to administer it, interpret results and give feedback to both respondents and decision-makers. Also, having successfully completed BPS Level 1 & BPS Level 2 Ability, in addition to BPS Level 2 Personality, you will be able to apply for the Euro Test User Certificate from the European Federation of Psychologists’ Associations (EFPA). 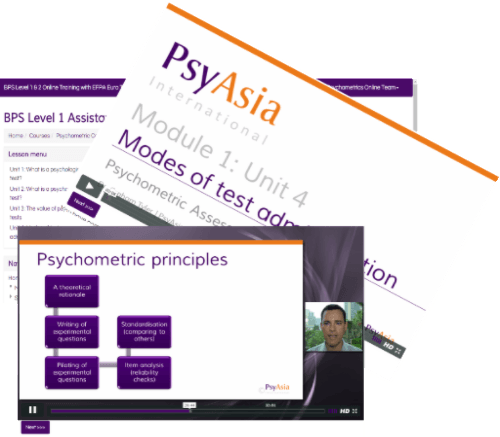 PsyAsia International’s Online Identity® User Course enables you to use the Identity® Self-perception Questionnaire competently by dedicating approximately a weekend of your time (through 5.5 hours of video training, 9 quizzes and 1 final exam). The course is cost efficient and you are able to purchase Identity® credits within one business day of passing the final exam.